The Nutri Ninja Pro blenders are single serve compact blenders with a lot of power. They are smaller than a traditional blender, which is great if you have a tight kitchen or if you have too many other appliances. We review three Nutri Ninja models here: two Nutri Ninja Professional models, the BL455 and the BL456, and the Nutri Ninja with FreshVac™ and Auti-iQ Technology (the BL580). After reading this review, you will know for sure which of these three Nutri Ninja models will work best for you in your kitchen. You may also use the Table of Contents here below to skip to any of the three models that you may be most interested in or other specific areas of this review including questions that shoppers have about Nutri Ninja blenders. Or, just continue reading through the whole thing. What Is Ninja And Where Is It Based? What Is The Best Nutri Ninja Personal Blender For You? How Tall Is The BL456 And How Much Does It Weigh? So Who Is The BL456 Best For? How Does The Nutri Ninja BL455 Operate? How Much Does The BL455 Weigh And How Tall Is It? Who Should Buy The Nutri Ninja Professional BL455? How Tall Is The BL580, How Much Does The BL580 Weigh? Who Is The BL580 Is Best For? What Are Some Recipe Ideas For Nutri Ninja Blenders? Are The Blender Cups That Come With Each Of These Three Nutri Ninja Models BPA Free? What If My Blender Cups Are Leaking? Can I Mix Dry Goods With A Nutri Ninja? Can I Make Soup With A Nutri Ninja? Are The Nutri Ninjas Dishwasher Safe? Will These Nutri Ninjas Crush Ice? Are These Nutri Ninjas 11o Volts Or 220 Volts? What Are The Blender Blades Made Out Of And Are They Sharp? What To Do If My Nutri Ninja Won’t Turn On? Ninja blenders date back to 1995, where the company started marketing itself through info-mercials from it’s original Montreal, Canada headquarters. Ninja is now part of the SharkNinja Operating LLC group where Ninja still manufactures blenders, obviously, but also countertop cookers, coffee makers, pressure cookers and slow cookers. Safe to say, Ninja makes a lot of products, with new products and even new product lines added regularly. In total, SharkNinja has over 150 products. The Shark division of the SharkNinja group manufactures vacuums and other home cleaning systems. SharkNinja, including Ninja, is now headquartered in Needham, Massachusetts. SharkNinja also has offices in Canada, the United Kingdom, China and Japan. The CEO of SharkNinja is Mark Rosenzweig, who is also the founder. Each model that is reviewed here in enough detail to help you make a decision. We describe what we like and what we don’t like about each model. We also give you a summary of each model based on what it can do for you in the kitchen and guide you to the best model for you. Ninja makes a lot of different blenders and even other appliances and it’s hard to keep up with line of products. That’s why we’ve only focused on the Nurti Ninja Pro blenders. The Nutri Ninja blenders are only a small subset of all Ninja blenders and each of the three Nutri Ninjas reviewed here are single serve (or nearly so), blending up to 24 ounces in the blender cups included with each blender. These smaller sized blenders are much different than Ninja’s multi-cup full sized blenders, which are the majority of their blenders (if you want to see a detailed review of those, see the bottom of this review). The biggest difference with the Nutri Ninja models is their smaller size. The blenders themselves are smaller as are the blender cups that are used to blend. The largest Nutri Ninja cups are only 24 ounces, while a full sized Ninja blender pitcher is 72 ounces. The Nutri Ninjas were designed for small serve or single servings and made to be portable with sealed lids to take with you. So, if you’re looking for a conventional sized blender pitcher, the Nutri Ninja blenders are NOT for you. For reviews of full sized blenders, see the links to several Ninja blenders and blenders from other companies at the bottom of this review. If, instead, you’re looking for personal blenders, then keep reading and see each of the three Nutri Ninja models reviewed here. The Nutri Ninja Pro BL456 is the least expensive Nutri Ninja model reviewed here, and like each of the three Nutri models we cover, it is very simple to use. Credit: Ninja, to see the BL456 on Amazon with latest pricing and warranty options, click here. The BL456 motor base is 900 watts, plenty of power for each of the two Nutri cups (Nutri Cups: 18 ounces and 24 ounces versus 72 ounces in a full sized blender) that are used to blend with these models. It is also the least powered of the three reviewed here (this motdel is 900 watts, the BL455 is 1,000 watts and the BL580 is 1,100 watts). The BL456 is powerful enough to do a pretty good job in crushing ice, extracting juice, breaking down seeds and other blender functions, as noted by satisfied customers. Each Nutri Ninja cup comes with its own lid. The Nutri cups are designed for taking them with you out and about can always just use them as you would use any cup. The BL456 is also very simple to use, just lock your choice of two cups onto the motor base and press the blender cup down into the blender and it will pulse for as long as you press it. Careful not to over blend your ingredients. You control the pulsing of each blend manually, there are no automatic modes. The BL456 even comes with a 75-page recipe book to give you inspiration to use it beyond your regular morning smoothie. The BL456 is 14 inches high, so make a note of that when measuring your countertop space where you plan to use it. It also weighs about 8 pounds, so it’s pretty easy to move it, or even take it with you somewhere else if you need to. The Nutri Ninja BL456 is pretty inexpensive and is the best option for you if you want a low cost single serve or small batch blender that is still powerful enough to do what you expect a blender to do. The BL456 is very good at crushing ice and blending frozen foods since the motor is pretty powerful for the size of the blender cup whether the 18-ounce cup or the 24-ounce cup. As described above, the operation of the BL456 is as simple as pulsing while pressing down on the locked-in blender cup. So, for those who value simplicity, this model or the BL455 reviewed next are both as simple to operate as a blender gets. If you want some more functions with your personal, single-serve or small batch blender, then consider the BL580 with its Auto-iQ system. The standard Ninja limited warranty is only 1 year, that’s almost always too short of a warranty for these types of small appliances. We recommend buying an extended warranty with this model since they’re pretty cheap and worth having the extra protection. For warranty options and current pricing with any discounts, see the Nutri Ninja BL456 on Amazon here. The Nutri Ninja Professional BL455 is in many ways similar to the BL456 reviewed above, but also has some important differences. The BL455 has a 1,000 watt motor, a little more powerful than the BL456, which has a 900 watt motor. Both are fine for blending and will perform well, but it’s nice to have more power available for grinding or chopping tough nuts, stems other other stuff that’s harder to blend. Finally, the BL455 includes a recipe book with 75 recipes, just like the BL456 does. The Nutri Ninja blenders are really simple to operate, which is good and bad. The good is that the BL455 is just easy to use. To operate, fill your blender cup with your blender ingredients. Seal the blender cup with by attaching the lid. Then, flip the cup over and insert into the blender. Then, just push the cup down and it will blend as long as you want to. Ninja recommends using this “Pulse” action in bursts instead of continuously since you’ll know after each pulse how well blended your ingredients will become. The “bad” part of the simple to operate is that there aren’t any more functions than manual pulse. The BL455 is about 12.5 inches high (depending on which blender cup you are using), and weighs about 7 pounds. Like the BL456, this blender is small enough to even take it with you for travel or even to add additional blender power to your next party. The Nutri Ninja BL455 is a single serve, or small batch blender with a powerful motor that is simple to operate and easy to clean. The BL455 is also not too big on your kitchen counter. If that’s what you’re looking for in a blender, then the BL455 is a great choice. Compared to the BL456, the BL455 has a little more power, has another blender cup (3 in total) and costs more than the BL456. If you want more functions, a little more power and vacuum technology, then look at the BL580 below. But if you don’t really need automatic functions, vacuum technology, a little more power and you don’t want to have to pay for those extra features, then stick with the BL455. The BL455 comes with just a 1-year limited warranty. We recommend buying an extended warranty with these blenders. Buy the longest warranty coverage you can get since they are fairly inexpensive. These small appliances are prone to breakdowns and failures, and you don’t want to be stuck with a broken machine after the 1-year warranty expires. You can see the BL455 on Amazon here with latest pricing, any discounts and extended warranty options. 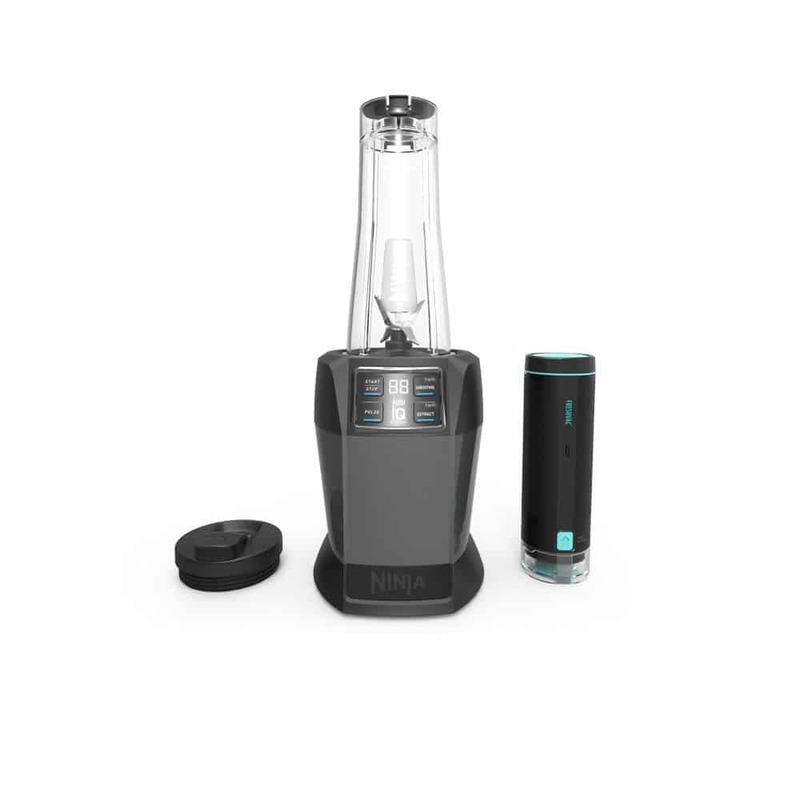 This Nutri model features Ninja’s newest technology, with both Auto-iQ automatic blending system and a vacuum pump. The blender base is 1,100 watts, the most powerful motor of the three reviewed here. The Auto-iQ System will automatically run the blender in either of two modes, “Smoothie” or “Extract” in addition to the manual, “Pulse” mode. Smoothie mode is designed to use the motor most efficiently to blend frozen fruits or other foods with juice, milk, ice, or ice cream into a drink. Extract mode is designed to use the blender motor in the best way to extract nutrients from dense, leafy vegetables, including seeds, stems, skins and other fibrous parts of whole vegetables or fruits to break them down and “extract” all of the fruits or vegetable nutrients. The FreshVac system is basically a battery powered vacuum pump that is designed to take most of the oxygen out of your ingredients before you blend them. The theory is that your blended ingredients will stay fresher longer without oxygen to break them down. The vacuum will also make your blended smoothie or juice creamier and less “frothy” than without it. The motor base of the BL580 also includes a digital countdown timer to let you know the time remaining to blend, whichever mode you choose. To operate the vacuum, you just seal the blender cup, attach the vacuum motor to the blender cup and turn it on, you don’t even have to hold it. It will run automatically then stop itself when done. This system also comes with two 24-ounce blender cups and sealing lids. The BL580 is almost 16 inches high with the blender cups attached, good to know when planning where to put your blender in your kitchen. Measure your countertop to cabinet distance to make sure you have room. The Nutri BL580 weighs about 9.4 pounds, so it’s fairly easy to move or carry. The BL580 Nurti Ninja FreshVac is for those of you who want a single serve or small batch blender that has more functions beyond just the “Pulse” functions of the BL455 and BL456. The Auto-iQ System adds a “Smoothie” and “Extract” function to the manual “Pulse” mode. These modes use the motor to automatically blend for either function so you don’t have to hold the blender cup down into the blender like you do for the two other Nutri models reviewed here. Also, the vacuum pump does make for a creamier smoothie or other drink by removing excess oxygen, which should also keep your blended drink fresher, longer. The vacuum pump will also keep your drinks from developing “froth” at the top of your blender vessel that often happens when blending some ingredients. So, for two automatic modes and a vacuum pump in a single serve or small batch blender and a powerful 1,100 watt motor, go with the BL580. Just make sure you buy an extended warranty (highly recommended) since they’re cheap and worth extending protection beyond the 1 year warranty that Ninja provides. You can see the Nutri Ninja with FreshVac on Amazon with latest pricing, any discounts and extended warranty options here. Yes, each blender cup, whether 12 ounce, 18 ounce or 24 ounce, are BPA free. Hopefully the blender cups aren’t leaking as a manufacturer defect, if so hopefully you’re still in the warranty period or bought an extended one. Check to make sure that you don’t overfill the blender cup past the cup’s overfill line, since leaks also occur from overfilling. You may even want to “underfill” them a little just to be safe. Ninja does NOT recommend using any of these Nutri Ninja models to mix dry ingredients or grind since these models were designed to blend in liquids. So, add your dry ingredients to a liquid before blending if you can. Basically, no. The Nutri Ninja cups are not designed for blending hot ingredients, since hot ingredients increase the internal pressure of the blender cup beyond what Ninja considers to be safe. Basically, you’re risking a “blow out”, with hot liquids sprayed all over your kitchen by blending hot liquids. If you need to blend soup ingredients, start with the Nutri Ninja before you heat them. Ninja says you can wash all of the components, including the blender cups, in the dishwasher. Ninja further recommends putting the blender cup lids and blade assemblies in the top rack of the dishwasher. Our recommendation though, is to hand wash or just blend warm soap and water in these Nutri Ninjas when possible. Repeated dishwasher use will probably shorten the life of some or even all of the components. The high heat of the dishwasher over long cycles will probably add some wear and tear over enough cycles. Yes. Ice crushing is one of the things that these blenders were designed to do, they do a pretty good job too since they each have a fairly powerful motor. All of the Nutri Ninjas are 11o volts, they won’t work in a 220 volt system. The Nutri Ninja blades area stainless steel. Be careful when cleaning them or even be careful when you touch them since they’re really sharp and will cut if you’re not careful. Before giving up and calling for the warranty or throwing the thing away, check to make sure (1) the blender cup is attached correctly and (2) check if you can reset the motor thermostat. The motor may have become overloaded by use, maybe grinding a really bunch of frozen foods for too long. If that’s the case, the motor will shut itself down to prevent motor damage and you’ll need to reset it. To reset it, just unplug the blender base from your outlet and let the machine cool down for about 30 minutes. You can also check to make sure that there’s not any ingredients stuck where the blender cup attaches to the motor base. After 30 minutes, plug the blender back in, attach the blender cup correctly and see if it works. Operating manuals for each of the three manuals reviewed here can be found by clicking on the links to each one below, along with information about what is included with each Nutri Ninja model. For the BL450 series (including the BL456) Operating Manual, click here. Each Nutri Ninja warranty is a 1-year limited warranty. As we recommend for each model reviewed in detail above, that warranty period is probably too short. Ninja also has this short 1-year warranty period in it’s full sized blenders. We recommend buying an extended warranty for any Ninja model that you purchase whether a Nutri Ninja or full sized Ninja. Each purchase option detailed above will give you extended warranty options, some up to four years. We usually recommend buying the longest extended warranty available, since they are usually inexpensive. Most small appliances don’t last very long and can fail even in the first year, or just after a year when your Ninja warranty has expired. If you product does fail or you have a question or issue, you can contact Ninja directly. Their contact phone number is (888-826-6044). Ninja recommends that you register your blender before you call. Ninja’s operating hours are 9 am to 9 pm Monday through Friday and on Saturday from 9 am to 6 pm. All times are based on the Eastern Time Zone. We reviewed several full-sized Ninja blenders and also reviewed several in comparison with other brands. 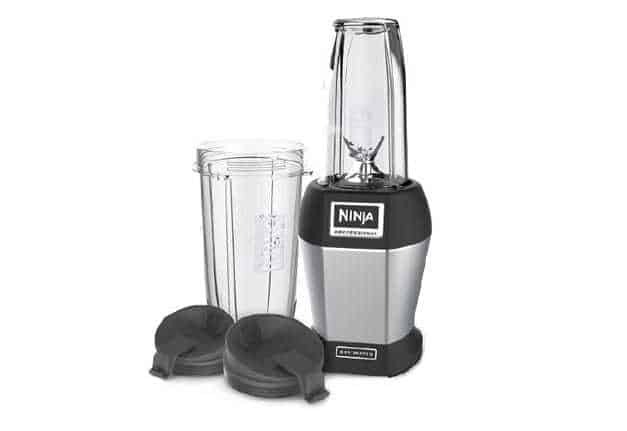 For a recent review of several Ninja models, read this review of Best Ninja Blenders. This best blenders review will show you how some Ninja models compare with other brands. Finally, here’s another review of the Ninja CT682SP System and comparison with the Vitamix 750 Heritage. Also, if you want a great blender recipe, here’ s a drink recipe that includes healthy ingredients, some of which are dense enough to give your blender a power test.